a TRIO program. Wearing a big grin and giving an enthusiastic “Good morning!” to the small crowd gathered to hear him speak, Martinez shares his experience with TRIO. “Without this program, I would just be another freshman at college, lost at sea amongst all my responsibilities that I now have, that I had no clue about before,” he said. On April 26, Arizona Western College held TRIO Day at the Schoening center, giving community members and students the opportunity to learn more about the program and what it has done for the college. The event included not only current and future student TRIO members, but also leaders from the community such as Yuma City Council member Edward C. Thomas and Yuma County supervisor Russell McCloud, who showed their support for the program and emphasized the importance of access to higher education for students from a disadvantaged background. Through the Higher Educational Opportunity Act of 1964, the experimental education program Upward Bound was created, followed by Talent Search in 1965 and finally Students Support Services in 1968. The TRIO Project was officially established on February 24, 1986, dedicated to serving disadvantaged students with their academic careers. If a student identifies as first-generation – meaning neither of their parents have obtained a Bachelor’s degree – comes from a low-income household or has a documented disability, they are eligible for any of the TRIO programs. Across the state, 39 active TRIO project sections serve approximately 10,500 students. According to the Arizona TRIO Projects 2015-2016 Annual Performance Report, seven out of ten High School graduates involved with TRIO are enrolled at a college or university, 94 percent of undergraduate students being in good academic standing. Since 1991, AWC has assisted students in three distinct TRIO Project programs offered at the various campuses. With aid and encouragement, TRIO students navigate their way from middle school through college graduation, all while learning how to reach their fullest potential as a student. Depending on their educational level, participants are placed into one specially designed program – Upward Bound, Talent Search or Student Support Services (KEYS) – often advancing into the next level. AWC works with 69 students in the Upward bound program – which focuses on students from ninth through twelfth grade. Participants from Cibola, Kofa, Yuma, Parker and San Luis high schools get to experience an intensive college curriculum on Saturdays for six weeks during the summer at the Yuma campus. Talent Search focuses on students from grades six through twelve. AWC provides services to 583 students from various Yuma and La Paz middle schools and high schools, motivating them towards reaching their high school graduation and beyond. Additionally, Talent Search finds students who did not enter or finish a post-secondary education and encourages them to return and get their degree. KEYS, servicing more than 240 students, focuses on providing services such as academic advising, career exploration and advisement, financial aid and scholarship assistance, life skills and money management workshops, and much more. 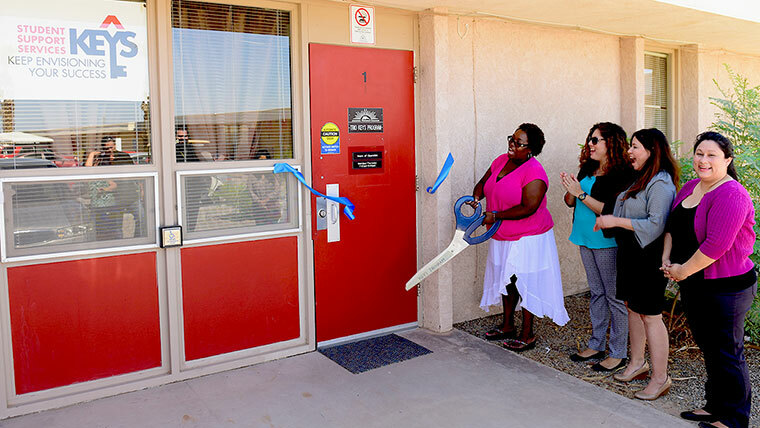 The Arizona TRIO Projects also include additional programs for individuals not in middle or high school. The Educational Opportunity Centers give qualified adults assistance and information on postsecondary education admissions in order to encourage and increase the number of adults enrolled in college. Those seeking to continue their education past their Bachelor’s and Master’s degrees can participate in the Ronald E. McNair Post Baccalaureate Achievement Program. By guiding students with high academic potential through their undergraduate programs, universities even lead disadvantaged students in obtaining doctorates. Veterans Upward Bound provides services such as tutoring, counseling and academic instruction, allowing veterans to build basic skills to increase their chances of finishing a college or university, while Upward Bound Math-Science focuses on interesting students in pursuing a post-secondary degree and a career in math and science. Many AWC alumni who had been involved in the TRIO programs and graduated from a university continue to serve their community and the college. Some even return as staff members, like Angelica Gebhardt, who is now a Support Service Program specialist at AWC. She was also president of the Arizona TRIO chapter for two years, representing the 39 active programs. In contrast, Robin Martinez Jr. is just starting his university experience through the TRIO program, taking pride in being a spokesperson for the program and attending events like the TRIO Day in April.